CHICAGO – Mirror images of desperation met at the United Center on Thursday night, the Chicago Blackhawks and Flyers entwined in each team’s latest round of playoff knockout. They played it that way, too, the puck rolling around at times as if a roulette ball, the winning goal of a 3-1 Flyers victory scored from a harmless-looking turnaround backhander that James van Riemsdyk flipped from above the circle as Sean Couturier created a screen in front of Chicago goaltender Corey Crawford at 9:50 of the third period. Couturier added an empty-net goal in the final minutes. JVR’s goal was only relevant because of another out-of-body effort from 20-year-old goaltender Carter Hart, who repeatedly erased egregious mistakes that led to the "Grade A chances’’ interim coach Scott Gordon has tried to cut down on since his arrival in mid-December. Hart stopped 40 of 41 shots to gain his 15th win of the season, and, more importantly, to keep his team dreaming of a playoff berth. Like the Flyers, the Blackhawks were dead in their tracks midway through January. Since falling to a record of 16-24-9 after a Jan. 17 loss to the Rangers, the Blackhawks are 16-7-1, climbing to within six points of Arizona for the final spot with a game in hand before Thursday’s game. The Flyers, too, were coming off a disappointing 3-1 loss to Montreal on Tuesday that dropped their already dismal odds to reach the postseason below a single percentage point (0.7) according to Sportsclubstats.com. Like Chicago, they paradoxically began that game, and Thursday’s as well, with an alarming lack of urgency, as if they were the chased and not the chasers. And both times it cost them. They fell behind 1-0 again in the first period, despite the best efforts of Hart, who made three spectacular saves while the Flyers were on a power play. But, after the Blackhawks got to full strength, Erik Gustafsson beat Hart to his glove side at 10:39. Corban Knight answered for the Flyers at 15:43, after the teams traded dangerous turnovers and near misses. It was Knight’s first NHL goal since Jan.5, 2016, when he was with the Florida Panthers, and it allowed the Flyers to escape a wide-open first period in which 30 shots were fired to escape tied. 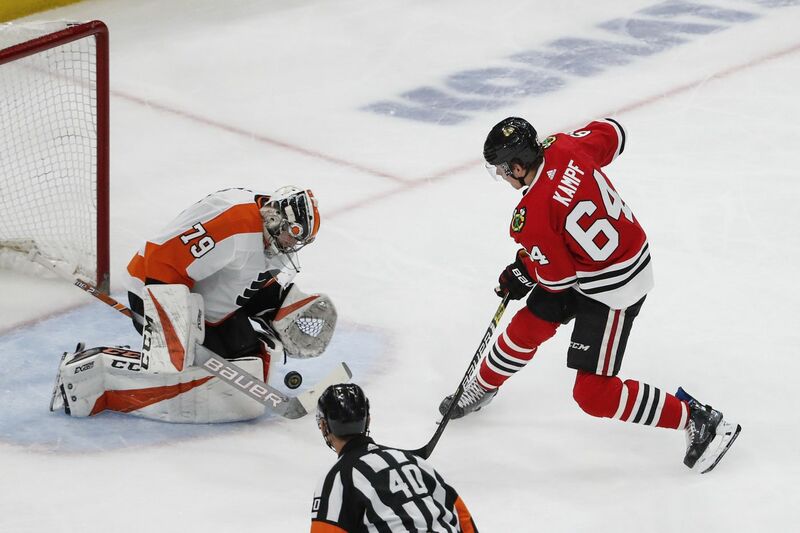 The Flyers fortune continued in the second period, particularly the second part of it, when Chicago peppered Hart with shots and had long stretches of continued play inside the Flyers zone. When the period ended, the Blackhawks had thrown 16 pucks at Hart, to no avail. So, once again it came down to a final-period push, to shrinking even further a margin of error that was oh so miniscule even before the game began. "It’s a long season,’’ Jake Voracek was saying beforehand. "A lot of ups and downs again this year. We still have a chance. We put ourselves in this situation being 16 points out,’’ I feel like every time we have gotten close, five or six points out with a big game to win, we lost it. There’s no one else to blame but us.